Katie Park doesn’t do cute; she does edgy. While it isn’t a term often applied to people who make a living with needles and yarn, consider the fact that she’s created Henry VIII and his six wives, two of them beheadable, as well as a giant calculator, a rotary phone, and a two-headed woman inspired by a circus poster. She wants to knit things so small the viewer needs a magnifying glass to see them, and so large they’re made with climbing rope. “The stranger it seems, the more it makes me want to knit it,” says Park. At the urging of friends, Park picked up knitting needles just a few years ago when she was a new mother living in Watauga County’s Vilas community. She had already worked in embroidery and needlepoint, techniques she still employs in creating wall art pieces, and earned a degree in metal sculpture from Appalachian State University. “I don’t need another hobby,” she remembers thinking. But a local knitters group persuaded her to join. “It was an instant obsession. Instant,” she says. Today, she is preparing her entries for the highly competitive Plush You! international exhibition in Seattle, Washington, said to be the largest show of handmade plush toys in the world. During December, a dozen of her works will be featured at Hanahou Gallery in New York, following a successful first show last year. “I got to meet one of my knitting idols,” she says. 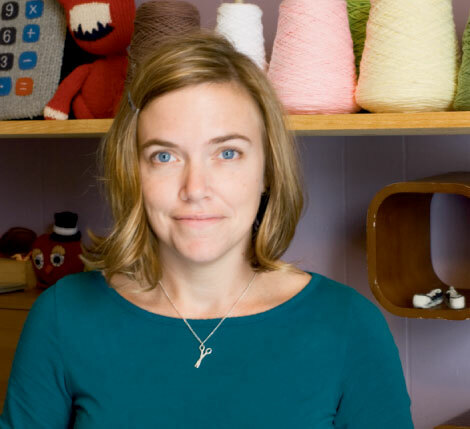 “We hit it off so well that we’re starting a pattern line of toys.” Park has devised a choose-your-own-adventure method that allows the knitter to make endless choices about which direction to take their creation, revealing a different toy each time. Her studio, at nth Gallery & Studios in Boone, is part of a cooperative that sponsors shows during Boone’s Art Crawl the first Friday of each month. There, Park continues to knit her way to fame.